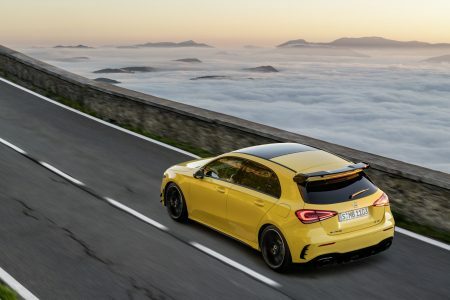 The new Mercedes-AMG A 35 4MATIC is the new entry-level model of the high-performance division. Set in motion by a new 2.0-liter engine, the hot hatch comes to battle Audi’s S3, packed with (super)horsepower. The new Mercedes-AMG A 35 4MATIC is the new kid in the AMG town. Developed simultaneously with its more potent sibling, the A 45, set to be presented soon, the A 35 4MATIC features newly tuned suspension, all-wheel drive system, transmission and driving programs for a more exciting experience behind the steering wheel. 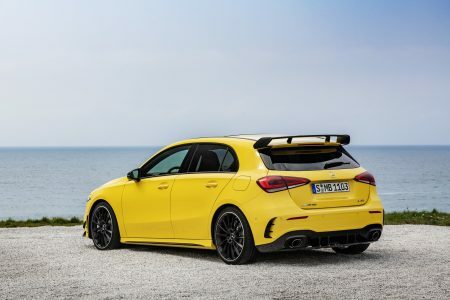 From the outside, the Mercedes-AMG A 35 4MATIC comes with an AMG Line front apron with flics on the air intakes, a front front splitter and silver chrome trims on the louvers in the outer air intakes are distinguishing features at the front. From the side, the 18-inch light-alloy wheels in twin-spoke design and the side sill panels of the AMG Line are instant head-turners. But you have seen nothing yet if you haven’t seen the rear, with a brand-new diffuser insert, an aggressive spoiler lip on the roof and two round tail pipes. The driver takes his seat in the ARTICO leather-covered seats with DINAMICA microfiber in black with contrasting red stitching and matching red belts. Red are the ventilation nozzles rings as well. 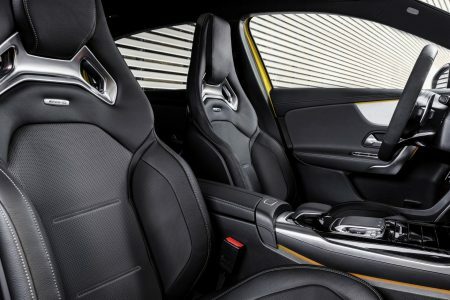 The new AMG compact car gets the MBUX infotainment system with innovative concept, instead of the previous COMAND system. The fully digital instrument cluster can display information in various modes. The Supersport mode is the highlight, with its 3D perspective. Various special displays such as Warm-up, Set-up, G-Force and Engine Data are also available. A typical AMG center console in piano lacquer finish with touchpad gets addition buttons for the control of the ESP functions, manual transmission mode and Adaptive Damping System. The functions can also be commanded by vocal control, once the “Hey Mercedes” salute is uttered. 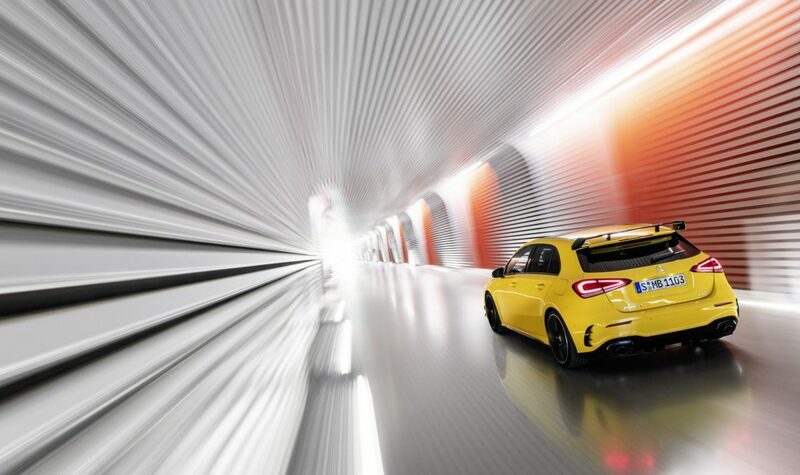 It takes the hot hatch just 4.7 seconds to run from a standstill to 100 km/h. The company’s new 2.0-liter 4-cylinder turbo engine, with cylinders divided in 2-cylinder groups and each directed onto a turbine flow of the twin-scroll turbine, found room underneath the bonnet of the car that it supplies with 306 horsepower (225 kW) and a maximum torque of 400 Nm. The power unit features the CAMTRONIC variable valve control, intelligent thermal management for engine and oil, high-precision piezo injectors and multi-spark ignition. The AMG SPEEDSHIFT DCT 7G dual-clutch transmission delivers the power towards all four wheels via the specifically set AMG Performance 4MATIC system. It covers a 50:50 percent distribution to the front and to the rear axle. The car is equipped with the standard RACE-START function that brings top throttle from a standstill, enhancing the emotions in the driver’s seat. An M mode engaged by operating the shift paddles behind the steering wheel in any driving mode brings extra excitement. 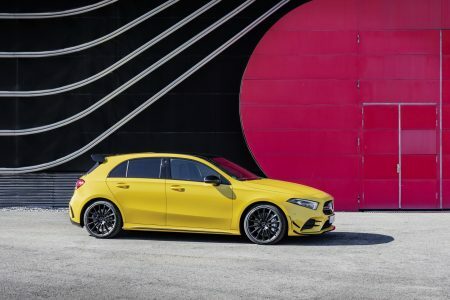 The Mercedes-AMG A 35 4MATIC stays in “Comfort” mode as long as the ESP is on. When the driver selcts the ESP Sport Handling or the ESP OFF function, the 4MATIC system switches to the “Sport” mode, for that “up to the limit” sensation. 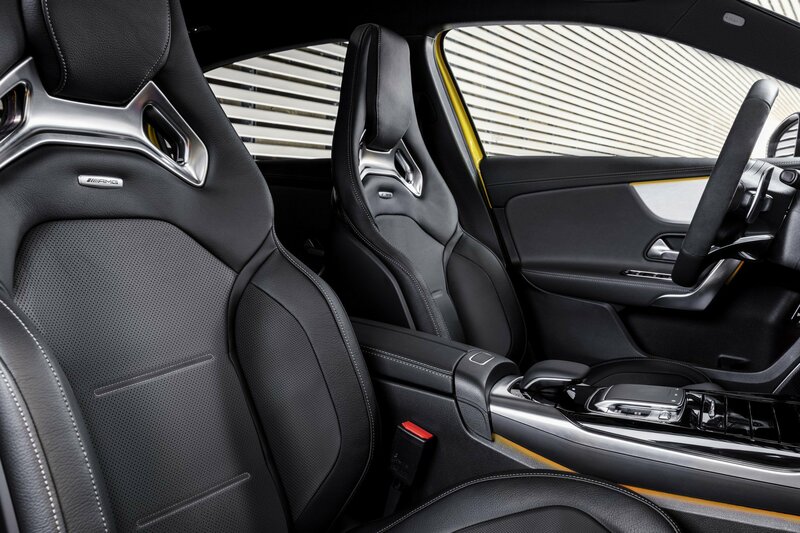 There are five AMG DYNAMIC SELECT driving programs onboard the A 35: “Slippery”, “Comfort”, “Sport”, “Sport+”. The car is fitted with the AMG RIDE CONTROL suspension. The new aluminum wishbone of the McPherson front axle suspension, together with the specially conceived axle geometry, bring the feeling of motor racing into a street car. 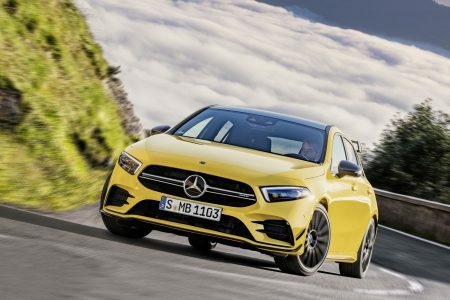 The new Mercedes-AMG A 35 comes with Adaptive Damping System that can be set in three different modes. A high-performance braking system makes sure that car stops when necessary, due to the new internally-ventilated and perforated 4-piston Monoblock fixed silver calipers and 350-millimeter brake discs on the front axle and to the 1-piston sliding calipers and 330-millimeter brake discs on the rear axle. And the sky is the limit for the fun. Or the track, for that matter, as AMG sets the AMG TRACK PACE, as part of the MBUX multimedia system. The system permanently records more than 80 vehicle-specific data, such as speed, acceleration etc., while driving on a race track. Sector times and lap times are displayed. The driver can analyze them and improve where necessary. The information is displayed on the multimedia screen, in the instrument cluster or on the optional head-up display. World-famous tracks such as the Nürburgring or Spa Francorchamps are pre-saved. The new Mercedes-AMG A 35 4MATIC will be displayed at the Paris Motor Show, starting 2nd of October. Sales start next month, while the first customers will receive their brand-new hot hatch in January 2019. Acceleration 0-100 km/h 4.7 sec.